The Online Masonic Pens, Regalia, Rings & Gift store! Masonic Supply Shop is a distributor of quality Masonic Pens and other Masonic regalia and supplies at competitive prices, serving the Masonic fraternity. Please do not hesitate to contact us for either a quotation or assistance regarding your order or our products. 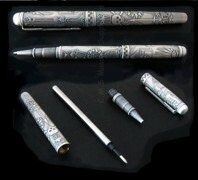 These are good quality old fashioned metal pens with an Antique Silver finish. Square & Compass, Acacia, Two Pillars, Bible, Plumb, Square, Level, Rose, Setting Maul, 47th Problem of Euclid, Hour Glass, Trowel, Skull and Bones, Gavel, Ouroboros Pentagram, Sun, Moon, Sword, Gravel, Candle, Smooth Ashlar, Rough Ashlar, All seeing eye. A Beautiful Pen!... definitely a conversation starter.